4. 戻る 永積洋子「十七世紀後半の情報と通詞」『史学』第60巻　第4号、1991, pp.2-3. 8. 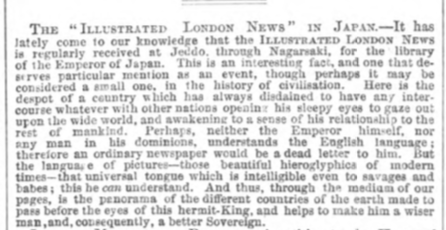 戻る The Illustrated London News, vol.24, Jan.-June, 1854. 9. 戻る C.N. Williamson, “Illustrated Journalism in England: Its Rise.—I” (pp.104-108), “Illustrated Journalism in England: Its Rise.—II” (pp.141-144), The Magazine of Art, vol.12, 1889. 10. 戻る C.N. Williamson, “Illustrated Journalism in England: Its Development.—I” (pp.297-301), “Illustrated Journalism in England: Its Development.—II” (pp.334-340), “Illustrated Journalism in England: Its Development.—III” (391-396), The Magazine of Art, vol.13, 1890. Copyright (C) 2016 andrewlangessays.com All Rights Reserved.